play some disc golf, basketball, and possibly soccer (can someone teach me to play soccer? I am sure there is something I am forgetting. I am not sure I can accomplish all of this in 6 weeks. Say some prayers, breathe some for me. My family (Dad, Mom, Adam, and I) just got back from vacation in Cincinnati. Cincannati is like dissecting owl pellets: you have to wait through the disgusting stuff to find the gems inside it. The majority of the city of Cincinnati, not the suburbs or the outskirts, looks like the worst neighborhood of most other big cities. We wanted to walk to Findlay Market, but the shuttle driver at our hotel said he’d better drive us because the neighborhood was so bad. I agree. Usually, I am unmoved by deteriorating neighborhoods. I am not afraid of loitering people, or run-down buildings, but this area of Cincy was more than just derelict. People had looks in their eyes that were so down-trodden, so forlorn, that I was afraid of them. They looked the way Cormac McCarthy describes people in The Road. That desperate. That carnal. While we were there, each morning the news reported several shootings within a couple of miles of the hotel. My dad couldn’t sleep because of all the sirens, and there were literally 50 or so homeless people sleeping on the grounds of the library across the street. However, much like other big cities, if we stayed South of our hotel, toward the Great American Ball Park, there were no worries. In fact, there were multiple tourist attractions and affluent shopping malls, complete with Brazilian steakhouses and upscale clothing stores. I wish I could rest one day from thinking about culture. I wish the injustices and inequalities weren’t so blatant to me. Sometimes I just want to go back to not recognizing the painfully obvious way our society is stratified. I can’t though, so my heart hurts. I have a hard time having fun, but I have a hard time identifying how I can do anything to help a system so big and so broken. One of my constant prayers is for God to show me my role in helping to fix our very broken world. Also, I found this amazing graphic to help me plan meals while I am training. 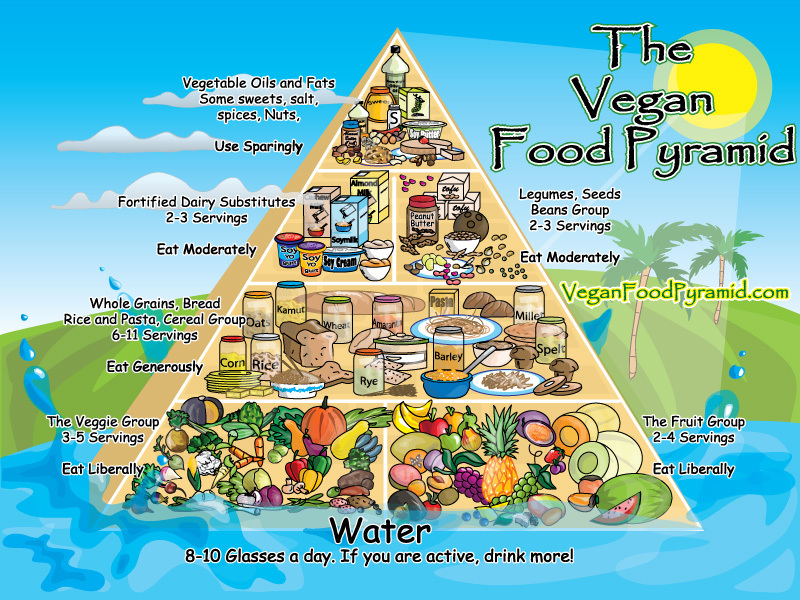 The only hard part about this pyramid is drinking enough water. Our water tastes pretty gross, and even though I know algae isn’t bad for me, I still don’t want to drink water that tastes like organic matter. Ew. This entry was posted in Disc golf, Dissertation, Fat, Food, Goals, IEI, Running, School, Swimming, Teaching, Vegetarian or Vegan, Writing. Bookmark the permalink. Do you want Eng 10 for the whole year? I’m supposed to have them for the second half but don’t mind (and probably would rather) letting you keep them. Seems like if you start with them, you should finish with them. I would be fine with English 10 all year.